It is difficult for me to disagree with the moves Toronto has made over this past off-season. I've now written about Toronto FC on RedNation Online for over three years and almost everything I questioned or suggested to improve the club from taking the draft more seriously, to concentrating on more depth, to improved international scouting, to implementing a reserve team to even signing Jozy Altidore - they have done. Despite all the deserved criticism Toronto FC gets, you have to give management credit for spending money to at least try to compete. 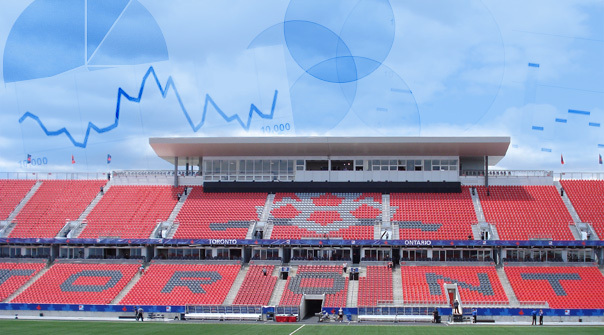 Last season the same statistical model had Toronto FC finishing first in the East and it expected a greater return from Bradley, greater influence from players such as Dwayne DeRosario, Bradley Orr, Julio Cesar and Gilberto, and a greater health and commitment from Jermain Defoe, although a warning of potential injury. Sebastian Giovinco and Altidore don't provide the same guarantee return as Defoe, as well New England, Columbus and my darkhorse - Chicago Fire, have improved from last season, so I have Toronto finishing fourth in the East in a playoff battle with DC United, Philadelphia and the New York Red Bulls, however, the whole Eastern conference should be fairly competitive. I do feel Joe Bendik struggled last season. His 1.67 goals against average and .648 save percentage speaks it for itself and add to that he was making a similar salary to Stefan Frei, the new ever present keeper for Seattle who Toronto let go. This being said, I don't think in soccer unlike hockey, the keeper makes the difference in a team being a successful or a failure. 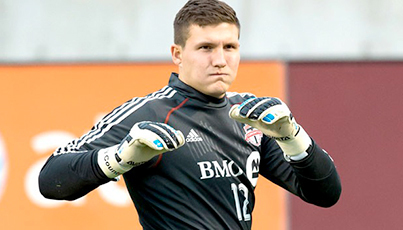 However, I do think Bendik's time in Toronto is numbered unless he improves his performance. Alex Bono was the player I expected Toronto to draft with their 1st round pick. I have seen him play on a number of occasions and he looks like not only an MLS keeper but a future United States national keeper. As well, and very encouraging, Quillan Roberts did well on loan with Wilmington last season allowing 20 goals in 17 games. I expect Bendik to be the starter this season although Bono to play in some first team games. In my 2014 season review of Toronto FC I documented the struggles the club had last year after Steven Caldwell's injury and more was expected but failed to materialize from veteran defender/midfielder Bradley Orr. 2015 begins with the same hopes and concerns: Caldwell seems healthy, but at 34 years of age it’s hard to expect a full season out of him, and new signing Damien Perquis brings some good experience and his dedication to defending is strong, although there are concerns. Perquis was an adequate defender for Sochaux, a mid-table French Ligue 1 side, but struggled during his time in Spain with Real Betis, traditionally a strong La Liga club relegated last season. In the full back positions Justin Morrow is on the left, who has been a consistent MLS player but needs to improve his crossing, and looks like Mark Bloom who impressed later in the season is expected to be the starting right back but preseason might point to Warren Creavalle, as well Nick Hagglund, Marco Delgado and Jackson can potentially also play right full back. Ashtone Morgan adds back up at left full back while Eriq Zavaleta, Clement Simonin and Sklyar Thomas provide depth at centre back. Based on past experience, outside of Morrow the model does not expect an ever present season from Caldwell or Perquis, so it will be up to Greg Vanney to be able to mix and match his roster and for players such as Zavaleta, Simonin, Thomas and Delgado to mature and not be a liability when they are given minutes. 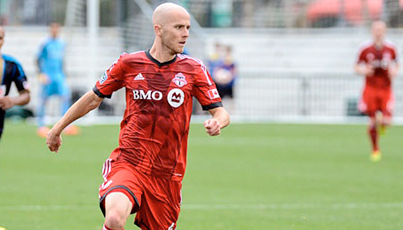 Despite the signing of Giovinco and Altidore, Toronto FC’s marketing have decided to make Michael Bradley the poster boy of Toronto FC for the 2015 season, which in many ways is fitting because based on what Bradley is expected to do could be the difference between success and failure. Last year, despite some good general statistics in regards to passing and effort, Bradley failed to make an offensive impact and the team was outscored by 15 goals when he was on the pitch. However, most of this could be blamed on how the team was set up and poor performances from other players. The biggest issue were two things: limited offensive help in the midfield, which Giovinco should help with, and players who lacked experience to team up with in the midfield. To improve this Toronto FC signed Benoit Cheyrou, an experienced defensive midfielder with over 400 games in France Ligue 1 who has shown an ability to be strong in defense, good passing skills including accurate long balls, and an ability to shoot from distance. If Cheyrou can remain motivated and healthy, he should provide the needed piece Toronto has been lacking for a number of years - a partner for the midfield designated player. Like in defense, the other midfielders lack experience but can provide useful skills if used correctly. Jonathan Osorio is a good technical player and could help with the build-up in the midfield, although if played on the wing he needs to be more active and also needs to improve his defensive contribution. If Toronto elects to start Collen Warner he has better defensive awareness including in aerial situations, but needs to be smarter regarding his offensive contribution. Jackson and Daniel Lovitz provide a more width through Jackson dribbling and Lovitz’s ability to cross, but both players have faults including consistency. While Jay Chapman, Manny Aparicio, and Chris Mannella provide depth in central midfield although are more likely to play minutes with TFCII then the first team. When eligible Bradley and Cheyrou will be automatics and Osorio looks to play a significant role. In general, based on the nature of the MLS, it is hard to attain depth at the forward position, although after a number of off season moves this shouldn't be an issue for Toronto FC. Giovinco and Altidore are the big names, however other new signing Robbie Findley has played 200 professional games including 23 with Nottingham Forest in the English Championship. While returners Luke Moore played 120 games in the English Premier League and Bright Dike and Jordan Hamilton are in the picture for their national teams. 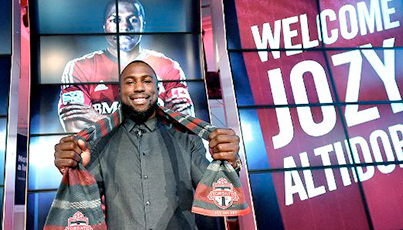 I wrote articles on both Giovinco and Altidore when they were signed by Toronto FC and was positive regarding both players joining the team for the 2015 season and beyond. I think Altidore will be a consistent double digit goal scorer in MLS and the current model has the number set at 13 for this season, while Giovinco is projected to be the only player to score double digits in both goals and direct assists this season. If I had a concern it would be at the start of the season with both players trying to figure out and get used to the style of play and refereeing decisions. However, the long term potential is great and I can see Giovinco being a star in the league and eventually involved in more than a goal a game. I also expect Findley or Moore to be in the starting eleven. I think Moore is the better player and could provide a consistent strike partner with Altidore, although Findlay is more likely to play a wing position and maybe not score but provide the teams options that Moore can't provide. I like both Dike and Hamilton as options off the bench, both having the ability of coming on and providing offense when needed. If given a chance I think a strikeforce of Altidore/Dike would be too powerful for any MLS defense to handle. I grouped the players by general position, then specific role because of the versatility that the collection of Toronto FC players offer. One of Ryan Nelsen’s faults was his inability to influence games and almost every match he played a 4-4-2 formation. Traditionally, MLS formations are not experimental with over 65% of games both teams either played a 4-4-2 or a 4-2-3-1. Based on the preseason Toronto are looking to play a 4-2-3-1 with Findley and Osario on the wings and Giovinco behind Altidore, although I personally think the best formation is a 4-3-3 with Osario just ahead of Bradley and Cheyrou in the midfield while Giovinco just behind Moore and Altidore up front, and you could also use Warner and move Bradley further forward. Toronto also has the option of playing a 5-3-2 with Jackson and Morrow/Morgan as wing backs, a 4-1-4-1 or 4-4-2 with Jackson/Findley and Lovitz/Osario on the wings, and a 4-1-3-2, 4-1-2-3 with only one holding midfielder. I feel greater awareness and risks with tactics including formations will help Toronto become a more successful and potentially a dominant team this year and going forward. The analytical model, based on expected statistics, has Toronto FC finishing 4th in the Eastern Conference and outscoring their opponents 54 goals to 49. The model expects Altidore, Giovinco, and Bradley to be dominant players and also expects a strong season from Cheyrou, Moore, and Findley, and improved play by Osario. It doesn't expect a consistent defense outside of Morrow and for Caldwell and Perquis to miss games during the season. My personal view is the current Toronto FC has the most options than I've seen in the past and outside of a few players who are going to have to prove themselves at the USL level, there is limited amount of players just taking up space with no expected contribution. Although the club is still very top heavy in terms of salaries, so key players need to remain healthy in what I believe will be a competitive Eastern MLS conference to be sure of a playoff spot. 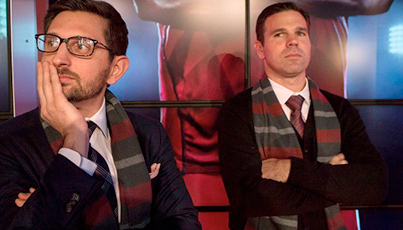 I was probably less surprised than most with the moves Toronto FC made this off season. 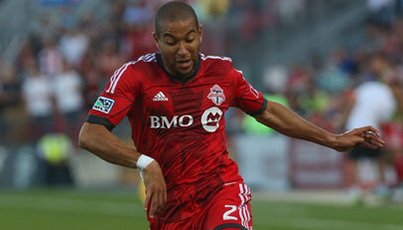 I expected Defoe to leave and I didn't feel Toronto was going to give Gilberto the rope to establish himself as a player in MLS. I expected improvements in goalkeeping, defense, and midfield and based on how Toronto is perceived now in the global soccer world, they have greater opportunities to sign veteran players. There is not much for me to question now and I also like Vanney as a coach and what he represents, but not sure yet if he has the ability to make a difference. However, from someone who lives in Toronto, I will be happy to stop my nitpicking and digging deeper into analysis as long as the club do what everybody here wants and "Just Win".